Whether you’re riding the bus or enjoying Calgary’s far-reaching light rail transit system — known in Calgary as the CTrain — Calgary Transit has you covered for your day trip desires in the city. If you’re looking to explore one of the communities outside city limits, allow the On It Bus to take you comfortably to where you’d like to go, be it the Rocky Mountains or the Cowboy Trail. Spend a day learning about science or history, or get out and explore one of the city’s many parks. Whatever you choose to do, don’t let traffic stand in your way with these 25 Day Trip Destinations via public transit. World famous for the stunning mountain ranges that surround it, Banff is only a couple of hours outside of Calgary and is a popular getaway spot. Admire the majestic Fairmont Banff Springs Hotel from across the river, or go inside to learn about its history and appreciate the architecture. The Banff Hot Springs are also the perfect way to relax in the rockies. If you still have time after checking out the downtown shopping experiences, ride the Banff Gondola for unbeatable photo opportunities and a dining experience at the top. How to get there: You can catch the On It Bus from Downtown Calgary or from the Crowfoot LRT Station. The Downtown stop is located at southbound 1 Street & 8 Ave SW.
Service runs on weekends & holidays from May 19, 2018 – September 3, 2018. Once in Banff / Canmore your On-It ticket gets you free transfers to the Roam Bus Banff Local routes. Much like Banff, Canmore is a beautiful town surrounded by the Rocky Mountains, but Canmore is closer to the city and has its own unique community charm. 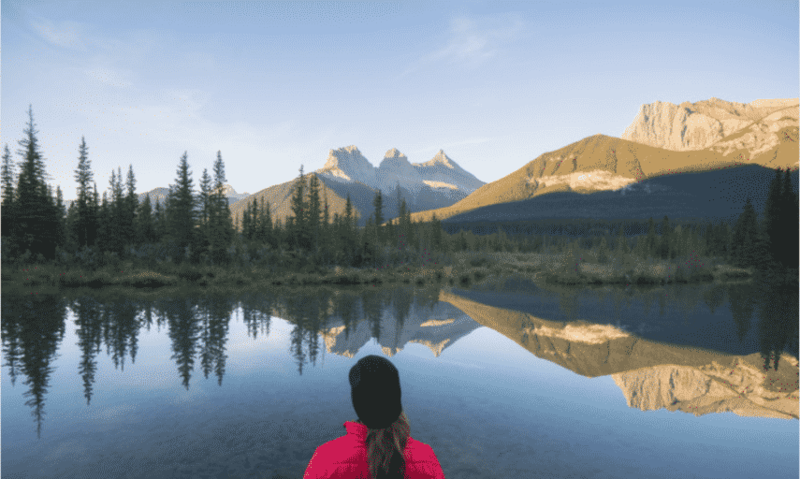 With many hiking opportunities and trails, you can get your outdoor adventure on at Grassi Lakes or travel to Ha Ling Peak. For a wild adventure, check out the a tour of the Canmore Caves. If chilling out in town sounds more appealing to you, grab a bite at the Grizzly Bear Pub or wander through the many shops and galleries on the main street. Less than forty-five minutes outside of Calgary is the town of Cochrane, known for its Western charms and hospitality. Surrounded by farmland and ranches for you to stay at and explore, this town is holding onto the spirit of the west, and is a prominent location on the Cowboy Trail. Take a trip to a ranch and experience life on the farm, or explore Glenbow Ranch Provincial Park at your own pace. Stop in at MacKay’s famous ice cream store for a scoop or two — this ice cream is worth the wait. How to get there: You can catch the On It Bus to Cochrane from Downtown Calgary or many other stops in the Calgary area. Find the stop and time that works best for you online. Within Cochrane you need taxi/car currently. Airdrie is a city located within the Calgary region, and is part of the Calgary metropolitan area, though has its own unique charms. Airdrie is known for its parks, which include Nose Creek Park and Iron Horse Park. In the summer, Airdrie hosts the Airdrie Pro Rodeo, celebrating the farm culture of the region. In the winter, check out the Airdrie Festival of Lights. If you’re looking to learn more about this community, stop by the Nose Creek Valley Museum, or appreciate the performance art scene at the Bert Church Live Theatre. How to get there: From Downtown Calgary, take the #902 Inbound Airdrie Transit Bus for an hour and a half. Disembark at Main St at Centre Av, Airdrie. Whether you want to check out the Alberta-famous Okotoks Erratic (also known as “The Big Rock”) or you’re here for the provincial parks, history, and golf opportunities, Okotoks is a community on the outskirts of Calgary with a small-town feel. Try a trip to the Emporium of Impossible Things antique store or explore Olde Towne Okotoks, enjoy a show at RPAC, the Art Gallery or look out over the prairies towards the mountains for a glimpse at how vast this country can be. You’ll feel enchanted by the spirit and pride that Okotoks has. How to get there: You can catch the On It Bus to Okotoks from Downtown Calgary or many other stops in the Calgary area. You need a taxi/car for going to nearby provincial parks and Okotoks Erratic. High River has become an increasingly popular filming location for television because of its natural atmosphere of sprawling flatlands, as well as the nearby Highwood River for which the town was named. You’ll feel as though you’ve stepped into the set of Heartland or Fargo when you visit. Check out the murals that have been painted throughout town, then get some historic context of the town at the Highwood Museum. If you like golf, you’ll love the Highwood Golf and Country Club, and foodies will enjoy the rustic and casual dining options, such as the Whistle Stop Cafe or the Hitchin Post Drive-In. How to get there: You can catch the On It Bus to High River from Downtown Calgary or many other stops in the Calgary area. For places around the town, other than downtown, you will need a car/taxi. Sikome Lake is your wilderness getaway within the city — a beach in the middle of the Prairies. This man-made lake is located within Fish Creek Park and flows from the Bow River basin. A popular destination for Calgarians in the summer, this lake sees up to 20,000 swimmers a day. A long stretch of sandy beach is a great place to spread out a blanket and read in the sunshine, and change-rooms, a concession stand, and a playground area are there to help make your day at the beach complete. Enjoy the sunshine at Sikome Beach in southeast Calgary. How to get there: Hop on the Somerset-Bridlewood CTrain and disembark at Somerset-Bridlewood Station. Transfer to the #78 Sundance bus and disembark at Sun Harbour Road. Fish Creek Provincial Park is a gem in Southern Calgary and sprawls through several forest areas, a lake, and even stables. Start at the Bow Valley Ranch Area for access to many of the pathways through the park as well as for its proximity to the Artisan Gardens which features artwork by over 60 established Canadian Artists. This area also features Annie’s Bakery and Cafe, and the Bow Valley Ranche Restaurant, which is well known in the area for it’s fine dining in a historic restored Ranche House. Between the natural splendours, the treats, and the Ranche House, you’ll have a full day ahead of you at Fish Creek Provincial Park. How to get there: Hop on the Somerset-Bridlewood CTrain and disembark at Canyon Meadows Station. Transfer to the #28 Deer Run bus and disembark at Deer Run DR @ Deer Park DR. From here, you are less than ten minutes from the centre of the park. Calgary’s Heritage Park is Canada’s largest living history museum, complete with a working train, a boat that sails across the Glenmore reservoir, costumed interpreters, livestock, and shopping and dining opportunities. Spanning between the 1860s to the 1950s, this look at the way life used to be on the Canadian Prairies proves both informative and fun. Bring the whole family to the park, as kids will enjoy the old fashioned ice cream parlour and candy store, as well as the midway. With the Heritage Town Square 2009 expansion, Heritage Park has become a year-round adventure into the past. How to get there: Hop on the Somerset-Bridlewood CTrain and disembark at Heritage Station. From there, catch the #20 Northmount Drive bus and disembark at Heritage DR @ Churchill DR.
Bowness Park is 74-acres of parkland along the Bow River in Calgary, built before the first word war. Though located in the middle of the city, this park features all kinds of impressive amenities and activities, such as a ridable miniature railway for children, a tea house, a boat house and skate shop with rentals available, and fire pits and BBQ stands. In the summer, head out on a boat or spend some time at the wading pool. The park is also a great winter getaway, with ice skating and cross-country skiing opportunities. How to get there: Take the #1 Bowness bus to 48 Av NW @ 88 St. From there, you are three minutes from the park. ⬆️ this could be you this weekend, living your best hammock life at #evJunction ☀️ Swipe left, take your pick of activities, and tag a friend to start making plans! The East Village of Calgary has historically been an neighbourhood of mixed uses. Containing Fort Calgary, this area is the earliest-settled land in Calgary. After expansion of the city disconnected the East Village from downtown, this neighbourhood was left to build its own ambiance. Now, the National Music Centre (housed in Studio Bell), has become a central hub of culture and tourism in Calgary. Other art shows come through Studio Bell all the time, so check out what’s happening in flourishing art scene of the East Village. How to get there: Studio Bell and the East Village is only a nine minute walk from the centre of downtown Calgary, and can be accessed from City Hall Station. The Military Museums are a network of museums that make up the second largest military museum in Canada. With memorials and galleries dedicated to those who served with a special focus on the Calgary-area regiments, this is a great experience for those interested in history. There is a life-size diorama under the entrance that is sure to impress, and several displays across the outdoor portion of the museum. For history buffs, there is an extensive military library that is part of the University of Calgary’s collection. This is the perfect educational experience for those wanting to understand a different angle of Calgary’s history. How to get there: Take the #7 South Calgary Bus to 20 ST SW @ Passchendaele AV. From there, you are a seven minute walk from the museums. Winsport’s Canada Olympic Park is a world-class winter sport training facility located near the community of Cougar Ridge. Featuring a ski hill that is perfect for experienced skiers, snowboarders, and those willing to learn, this is the destination for any active and adventurous family. The facility also holds events on its bobsledding, luge, and skeleton track, and on the aerial facilities for snowboarders and skiers. If you’re looking for summer fun, the area has extensive mountain bike trails that have become popular for their convenient location and accessibility to people of any level. How to get there: Take the Tuscany CTrain line to Brentwood Station and transfer to the #408 Valleyridge Bus. Get off at Canada Olympic Road. There are 270 species of birds at the Inglewood Bird Sanctuary, as well as 21 species of mammals and a handful of amphibians, reptiles, fish, and butterflies. This natural reserve is located in the Inglewood area of the city and is your perfect escape into nature. You can visit the sanctuary in both the summer and the winter months — the trails are open from dawn to dusk every day of the year. There is also a nature centre with an exhibit hall for an extra educational touch. Don’t forget your binoculars to get the most out of this unique wildlife environment. How to get there: Take the #1 Forest Lawn bus and get off at 19 St SE @ 9 Av SE. From there you are a ten minute walk from Inglewood Bird Sanctuary and Nature Centre. The Douglas Fir Trail is part of Edworthy Park and is known for its dense forests within the city. Here, you will see incredible views of the Bow River Valley from the 200 foot high escarpment. Natural springs have created an unstable slope in some areas, and because of this, some of the trees grow on a sloping angle, giving the area the nickname “the drunken forest”. There is plenty of wildlife and plant life in this forests, which is rich in minerals and at times has you feeling like you’re on a rocky mountain hike, even though you are never far from the city. How to get there: Take the 69th Street CTrain line and disembark at Westbrook Station. From there, you are a fifteen minute walk from the East Entrance of the Douglas Fir Trail. With almost 800 animals and a series of ever-changing exhibits, the Calgary Zoo is one of the most popular day trip destinations in the city. There are six zones in the zoo: Destination Africa, Canadian Wilds, Penguin Plunge, the Dorothy Harvie Botanical Gardens, Eurasia, and the famous Prehistoric Park. The Calgary Zoo has been celebrated for its efforts towards conservation, and is a longstanding favourite Alberta destination, with its first exhibit of animals opening in 1917. Right now, the zoo is celebrating the recent arrival of pandas as part of a panda conservation effort. Spend a day among the animals of the zoo, you’re sure to see something amazing. How to get there: Take the Saddletown CTrain line and disembark at the Zoo Station. The Telus Spark is Calgary’s science museum, complete with interactive exhibits, demonstrations, and multimedia presentations. Created in the name of teaching science in the most enjoyable way, it’s easy to spend a day lost in these halls. Science at the Telus Spark feels almost like magic. Check out the HD Digital Dome Theatre for a film experience that literally surrounds you, then take the kids to explore the Creative Kids Museum section. From innovation, to the world around you, to the depths of what it means to be human — everyone will learn something at the Telus Spark Science Museum. How to get there: Take the Saddletown CTrain line and disembark at the Zoo Station. From there, you are a twelve minute walk away from the Telus Spark. South Glenmore Park and North Glenmore Park are connected by the Weaselhead Flats, making this a massive stretch of parkland that is easily accessed in the city. Bordering the the Glenmore Reservoir, these parks feature hiking trails, wildlife sightings, paths, and washroom and water fountains during the summer. This is also a great place to go cross-country skiing in the winter. Because the flats were once used for military training, look out for the occasional fox hole. With the Elbow River flowing fast through the land, there is a little bit of everything in these two parks and the flats that connect them. How to get there: From downtown Calgary, take the #18 Lakeview bus and disembark at the 66 AV SW @ Lethbridge CR stop. From there, you are a twenty minute walk from the Weaselhead Flats. The Hangar Flight Museum, formerly the Aero Space Museum of Calgary, is a busy and growing museum that fosters the understanding and appreciation of the evolution of flight through tales told about the airplanes, helicopters and machines of flight in our collections. It’s about reaching for your potential, reaching beyond your limits and soaring where you never thought possible. Surrounded by machines and stories that inspire their imagination,you will learn of remarkable courage and innovation. How to get there: You can reach by Calgary transitroute 57(Erin Woods/McCall Way). Stops 7530, 7354,6298,4799 are within 300 meters of the museum. Reader Rock Garden is a historic park that features the restored Reader House, the Reader’s Garden Cafe, and picturesque paths and bridges through gardens of beautiful flowers. Open sunrise to sunset, this garden park is one of the most peaceful places in the city. The plant collections featured here are historical and protected, so enjoy the gorgeous blossoms without disturbing them. If you’re lucky, you’ll get to see some of the wildlife who have made the gardens their home. Dogs, however, are not permitted in the garden. How to get there: Take the Somerset-Bridlewood CTrain and disembark at the Erlton/Stampede Station. From there, you are a seven minute park away from the garden. Lougheed House is a national historic site that has seen many uses since it was built in 1891. This castle-like structure began as a family residence, then became a training centre for young women, then a women’s military barracks and blood donor clinic. Now, Lougheed House is available for historic tours of the property, gardens, and exhibits. The house is also used for live performances by cultural collaborators and features a restaurant that serves local and gourmet food. Lougheed House is the place to come to take in the beautiful mansion rooted in the past while also learning about Calgary’s history. How to get there: Lougheed House is located downtown and is a short walk from the city centre, but it is also accessible on the #3 Heritage Station bus. Disembark at the 12 Av [email protected] 5 St SW stop for closest access. The Bow Habitat Station is an educational adventure space that gives you firsthand knowledge of Alberta’s fish and wildlife populations. Check out the aquariums or stroll through the wetlands and see who you can spot. If you have a fishing license, try fishing in the Trout Pond. Fishing equipment is available for rent. The nearby Pearce Estate Park features a wetland along the Bow River, a playground, and the Sam Livingston Fish Hatchery. Between this lush park and the habitat station, you will experience the aquatic natural world that Alberta has to offer. How to get there: Take the #1 Forest Lawn bus and get off at 19 St SE @ 17 Av SE. From there you are less than ten minutes from the Bow Habitat Station. There are three man-made ponds in Carburn Park for you to enjoy — and plenty to do on those ponds, regardless of the season. In the hot months, take a dinghy, paddle boat, or canoe out on the water, or spend the day fishing. In the winter, try ice skating. This park used to be a gravel mine, but has since become an natural gem in the city of Calgary. With washrooms and picnic areas open year-round, Carburn Park is a great way to spend a day within the city limits. How to get there: From Downtown Calgary, take the #75 Riverbend Bus and disembark at Riverbend DR @ Riverview DR. From there, you are a ten minute walk from the park. CrossIron Mills is the largest mall in the Calgary area, and though it is located outside of the city limits, this shopping experience is worth the trip. Designed into four different “neighbourhoods” (The Fashion Neighbourhood, Ranch Neighbourhood, Resources Neighbourhood, and the Sport Neighbourhood), this giant mall exists on one level so that walking around is never complicated. If you’re looking for something specific or just want a shopping spree, CrossIron Mills is the perfect destination for you. How to get there: The CrossIron Mills Shopping Shuttle will pick you up from the Calgary Tower, the Southland CTrain Station, or the Brentwood CTrain Station. Mountain views, city views, a waterfall, and many paths for walking are all features of this little-known getaway in Calgary. The Ralph Klein park was named after Calgary’s former mayor, and is a recent addition to the park system of Calgary, having only been opened to the public in 2011. Artwork by artist Beverly Pepper can be found in the park, so bring your camera. Come and explore the man-made wetland, the community orchard, and the Environmental Education Centre, and keep your eyes open for the Natural Playground that will be coming soon. How to get there: Take the Somerset-Bridlewood CTrain and transfer at Anderson Station to the #409 Foothills Industrial Bus. Disembark at 56 St SE @ 114 Av SE. From here, Ralph Klein park is about a half hour walk away. Whether you’re heading to Eau Claire to see the market and the businesses there, Prince’s Island Park for a stroll along the river, or you want to walk along the Plus 15 Skywalk system (a connected route of indoor pathways through downtown) — there is plenty to do in Downtown Calgary. Stop by the Calgary Tower and catch a show in the theatre at the base, then head to Calgary’s entertainment district — 8th Avenue South features the Stephen Avenue Mall and many restaurants and unique shopping opportunities. Calgary is thriving, and its downtown core reflects this. There is also a bus from Sunridge Mall/ Rundle Station to Crossiron Mall.